I set my last book, Bonereapers, in Norway. The story takes place in late December during polar night, six hundred miles from the North Pole in the tiny town of Longyearbyen, site of the Svalbard “Doomsday” Seed Vault. Longyearbyen is a town so cold that it’s against the law to die there. Bodies don’t decompose in the permafrost and anyone who feels sick enough to die is urged to leave town pronto so that they can be buried in softer ground to the south. If Bonereapers had been published in Norway and released at Easter time, it might have been swept up in the ballyhoo that Norwegians call Påskekrim. Ninety years ago, Easter fell on April 1st and as an elaborate April Fool’s joke, a couple of Norwegian guys (Nordahl Grieg and Nils Lie) wrote a story about a robbery on the Bergen train during the Easter holiday. Grieg’s brother, who worked for a publishing company, helped get the story published under the pseudonym Jonathan Jerv. The publisher placed an ad on the front page of the Norwegian daily newspaper, “BERGEN TRAIN LOOTED IN THE NIGHT!” It appeared as if it were headline news and believing it true, thousands of people called the train station to check on loved ones who were supposed to have been on the train. The hoax caused a sensation and ever since, Påskekrim, which translates as “Easter crime,” has become a tradition and the peak season for reading crime novels in Norway. Publishers cash in on the Easter craze by churning out a fresh batch of thrillers and detective stories. The national television network broadcasts mystery programs and crime series – Sherlock Holmes, Agatha Christie, Alfred Hitchcock, and Harry Hole, the tough detective created by Norwegian writer Jo Nesbø. Even the national dairy company gets in on the act, printing cartoon mysteries on their milk cartons. Norwegian winters are long and dark and bitter. The night seems to last forever and there is a gloomy streak in the national temperament that inclines people to thoughts of death. The brooding landscapes, the aura of ancient stones and ghosts of the past strike a deep psychological chord and add a special sense of horror to the crime of murder. The mental picture of blood oozing across a blanket of pure white show is somehow more shocking than a pool of blood in a filth-strewn alley. Ironically, the homicide rate in Norway is among the lowest on the planet. Perhaps it’s the rarity of murder that makes crime fiction so popular. Far to the south in sunny Greece, the murder rate is soaring. Foreigners are being beaten and stabbed to death on an almost daily basis. Violence against women and the elderly has risen sharply and the police seem unable to stop the rash of brutal muggings and robberies. Clashes between the police and people protesting the austerity measures imposed by the German banks have resulted in deaths and widespread destruction of property. Even if the economy weren’t in a shambles and people could afford to buy books, there is no season for reading about fictional crime in Greece and less appetite for the genre than in Norway. Greeks read more than enough reports of real crime in the daily news. 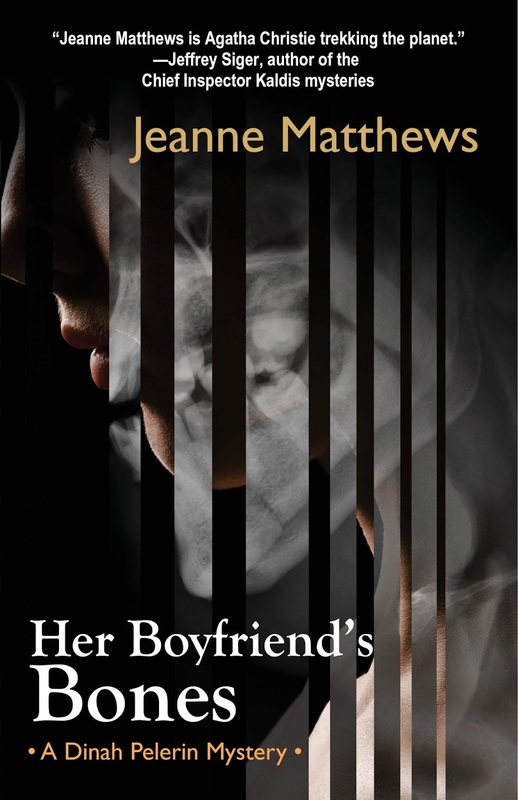 I set my most recent book, Her Boyfriend’s Bones, on the Greek island of Samos, which has become a transit point for refugees fleeing wars in the Middle East and Africa. Smugglers can transport their human cargo across the narrow Mycale Strait from Turkey in less than an hour, but the passage is treacherous. Many die in the attempt and the Samians, left to cope with the bodies washing up on their beaches and the horde of survivors who must be fed and housed, feel increasingly resentful. The debt crisis and burgeoning unemployment have stoked fear and xenophobia. No one trusts anyone. Corruption is rampant and bitterness bred during the military junta of the late ‘60s lingers on, making the island fertile ground for murder. My sleuth Dinah Pelerin has looked at murder north and south. Trust her when she says that blood spilled on a gleaming white beach is no less horrifying that blood on a field of snow. In 1973, on a remote beach on the Greek island of Samos, a movie star named Marilita Stephan murdered her boyfriend, his mother,and a powerful colonel in the military junta, a crime for which she was executed. Forty years later, Dinah Pelerin arrives on Samos to spend the summer with her Norwegian boyfriend Thor before she joins an archaeological dig nearby. A policeman on sabbatical, Thor seems unduly fascinated by the murders and Dinah soon discovers that the had more than romance in mind when he chose their holiday destination. Guns supplied to the former junta by the American CIA have turned up in Norway in the hands of terrorists and Norwegian intelligence has traced the source of the weapons to Samos. The island has become a transit point for refugees fleeing the Middle East. When an Iraqi immigrant with a fake ID is killed, Thor suspects a link to the arms traffickers. But before he can investigate, his car plunges off a cliff and he disappears. Greece’s economic woes have bred corruption and Dinah fears that he was betrayed by local police and either kidnapped or murdered. Unable to trust anyone, she sets out to find him. The deeper she digs, the more connections she sees between the present crime wave and what happened in 1973. Marilita may have been innocent, and the fate of her boyfriend holds eerie parallels to Thor’s disappearance. Dinah must be smarter and braver than she’s ever been to prevent another Greek tragedy. 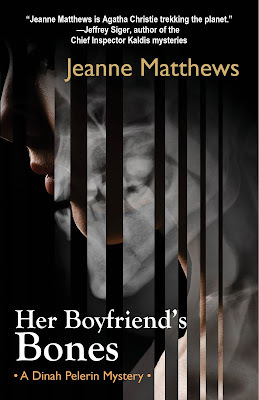 I have read all of Jeanne Matthews' books and this is my favorite. Dinah Pelerin is quite a character as you will see if you read Jeanne's other books. Dinah and I thank you, Laurie. Readers like you make it all worthwhile. That's so interesting about the Easter Crime hoax in Norway. The book set on Samos sounds very timely and interesting. Austerity has exacted a very high price in Greece. And bad economics, to boot! I haven't read this series but it sounds good. The Norwegians love their April Fool's hoaxes. Every year the local newspapers and TV stations put out a false story which they never bother to retract or correct. It's up to the public to decide if it's true or false. Talk about a wry sense of humor....!